Have you ever gone to your cupboard when you can’t be bothered shopping, or you’re in a hurry and no time to get anything, but have some hungry mouths to feed. This recipe is more or less down to the kids loving noodles, but not having any fresh in the house. Feel free to change the potatoes with any other veg you happen to have handy in your cupboard. Granted, this isn’t the prettiest soup on the planet, but it is like having a full meal in a bowl. Open your pack of instant noodles and break them up as you put them into your soupmaker. 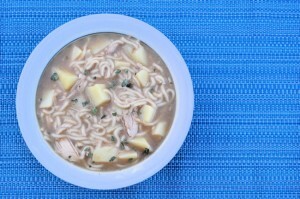 Add the cubed potatoes, stock cubes and the pack of flavouring from your noodles. Put the chicken in, then stir in the litre of boiling water. Make sure you do not overfill your own machine if it is different from mine. Choose a chunky setting for a bowlful that looks like a casserole, or blend it for a smooth version.